Martínez-Fernández, S.; Ayala, C.P. ; Franch, X.; Martins , H.; Ameller, D.
Tight time-to-market needs pushes software companies and IT consulting firms to continuously look for techniques to improve their IT services in general, and the design of software architectures in particular. The use of soft-ware reference architectures allows IT consulting firms reusing architectural knowledge and components in a systematic way. In return, IT consulting firms face the need to analyze the return on investment in software reference architectures for organizations, and to review these reference architectures in order to ensure their quality and incremental improvement. Little support exists to help IT consulting firms to face these challenges. In this paper we present an empirical framework aimed to support the analysis and review of software reference architectures and their use in IT projects by harvesting relevant evidence from the wide spectrum of involved stakeholders. Martínez-Fernández, Silverio [et al.]. 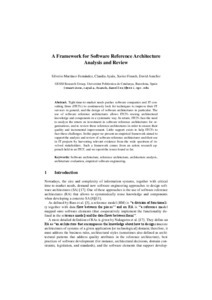 A framework for software reference architecture analysis and review. A: Experimental Software Engineering Latin American Workshop. "Memorias del X Workshop Latinoamericano Ingeniería de Software Experimental, ESELAW 2013: Del 8 al 10 de Abril, 2013, Universidad ORT Uruguay – Campus Centro Montevideo, Uruguay". Montevideo: 2013, p. 89-102.